Yes, it is not clear why sensitivities develop, but salicylates can magnify underlying sensitivities linked to gut permeability. Stress, NSAIDs, salicylate (including aspirin), antibiotics, and bacterial, fungal, or viral infections are some major triggers for increased gut permeability – allowing substances through the gut wall that would normally be blocked. It becomes a vicious cycle as more unauthorized substances get through the wall and histamine increases. It is important to identify the triggers through careful journaling and then avoid them for months or more sometimes. Some allergy/intolerance tests can shortcut the process, but they do not cover all possibilities. Liver enzymes also break down substances like salicylate, so improving liver health is part of a long-term goal with intolerances. Probiotics are important in supporting the liver as well as the gut barrier. Let us know what works for you! During a period of high stress and illness I not only developed high histamine levels but also salicylate sensitivity. It took me weeks to figure out the histamine factor and even longer to find out about the salicylate. Thanks for the tips! Animal products can impact the immune system by increasing inflammation, though there is so much more to the story! How an animal product is processed, how it is cooked, what the animal ate, and the type of animal product can dramatically affect the inflammation response. Plus, eating a soy or wheat-based fake meat might be more damaging to someone with histamine or gluten intolerance. But yes, animal products change our gut bacteria and consequently affect histamine levels – let’s keep an eye on this exciting new area of research! Histamine changes in the winter are correlated with the use of heaters and possible indoor allergens lurking in the ducts. Even dust mites in blankets or bedding may become more active as we spend more time indoors. Dry air from low humidity and temperature swings will make our respiratory system even more vulnerable to these allergens. Be sure to use bedding that can be washed in hot soapy water to remove the dust mites. Some companies will clean out the vents in case they are a possible trigger. I also regularly use the NeilMed Sinus Rinse kit during high-risk periods. Keep up the fight and you will win! Thank you for your work on assisting those of us with this condition! I am just starting now to attempt to figure out what is triggering it. But one huge trigger I have no seen anyone mention is that when approaching Winter and with the first radical temp drop cold snap, suddenly my histamines go nuts with copious mucus & itchy head, eyes, nose, face. I am 68 and this started happening a few years ago, so really dreading the coming of Winters now. And it is taking longer for my body to adjust to the cold with each new Winter. Have you heard of this and if so, what type of histamine intolerance does this indicate? Thank you! Eating animal products not only raises your acidity to one which bad bacteria like and good bacteria dont(we are naturally alkaline and not acidic enough to dissolve cholesterol anyway) but also introduces antibiotics to your digestive tract where 80% of your immune system lies, and kills off essential bacteria for immune function. Eliminating animal products from my diet cured my cat and seasonal allergies in 3 months. Also cured carpal tunnel and non stress related panic attacks. Thank you for pointing out this emerging link between gut bacteria and histamine! First, bacteria in the mouth can certainly affects bacteria in the small intestine, and SIBO will raise histamine levels. EarthClinic lists some remedies for infected teeth. If SIBO continues, consider some of the tips by Dr. Lynch, including increasing stomach acid production which helps reduce SIBO. A recent paper discusses the link between low acid and SIBO. Second, please consider adding good bacteria (probiotics) while flushing out the bad – particularly those from the Bifidobacteria genus. Take probiotics at different times of day than antibacterials such as oil of oregano (my favorite). The ProBiota product includes many probiotics that support histamine intolerance. Regarding estrogen, it has been linked to allergic disease and histamine response. you may want to consider different sources of estrogen that may affect histamine intolerance such as birth control and even xenoestrogens such as BPA, phthalates, pesticides, and parabens in skincare products. Scan through this list and try to reduce sources of exposure. Let us know if your histamine intolerance and SIBO improves with dental health – a great exploration. Thank you for all this information. I am in my late 20’s suffering with histamine intolerance symptoms. Doing as much research as I can. I was diagnosed with SIBO and Candida. But also wonder if my oral microbiome due to a suspected bad tooth is to blame on top of estrogen? I’m sorry for the delay – I was traveling. It sounds like you have been struggling with a smorgasbord of sensitivities for a long time. I can relate, as I was tortured by hives, rashes, and massive skin reactions to plants, cats, insect bites, and chemicals. I endured the skin suffering until my sinus infections became nearly constant. I finally got very serious about environmental allergies and got rid of everything in the house that triggered symptoms. I started washing linens in hot soapy water, discarded old upholstery that was filled with dust mites, and used an air filter 24/7. Some leaks and mold in the walls had to be fixed. Around the same time, I had to tackle food sensitivities after discovering that my celiac condition caused two years of back pain. Strictly avoiding gluten (and eggs and some dairy) also reduced my overall skin sensitivity. In retrospect, I can’t be sure which suspect (dust, mold, food, antibiotics, impacted wisdom teeth) was doing the most damage. Like you, I was panicking and playing whack-a-mole with a growing list of trigger foods. Sclerotherapy is known to cause itching during the healing process. Funny, I also became highly allergic to adhesive in common bandages when I was still battling my other allergies. In a nutshell (no pun intended), high histamine foods like bacon and pickles might not be so problematic after you reduce your primary triggers. Consider looking at environmental allergens as well as gluten intolerance, as they are some of the biggest hidden monsters in the closet. Estrogen and xenoestrogens contribute to histamine as well, so think about possible sources like birth control, pesticides, plastics, and body care products. SIBO (bacterial overgrowth) can also raise histamine, so consider Dr. Lynch’s fascinating recommendations on healing the gut. Hopefully by eliminating more triggers and your overall histamine load, both the tasty foods and vein procedures will be more bearable. Let us know what happens, and best of luck. I have always had random hives as a kid, touching desks that were not cleaned over summer break, rolling in the grass even had a bout of total body hives after swimming in cold water as a kid. Last year I was diagnosed with peanut and tree nut allergy. I am working diligently to avoid these but since dec I’ve been having more and more allergic reactions. After eating items like bacon, fried pickles basically whatever I eat at this point it feels like, I get rapid heart rate, nausea, flushing, hives on chest, sometimes vomiting and always diarrhea. These reactions freak me out causing me to panic. My heart rate stays elevated over 100 for many hours. Eventually the symptoms subside sometimes taking a full day with antihistamines, Benadryl/ Zyrtec, prednisone, IV fluids…. I feel foolish at this point keep going to the ER, I get the listed treatment with usually Pepcid and zofran. I’m allergic to mold, some trees, grass, 2x dust mites, cats, with others mixed in. I’ve been afraid to eat so stuck with foods I could clearly see the label with ingredients. Apparently bacon and banana are NOT good, my last experience was either due to the two banana and bacon I ate or from me touching my sons bread (?wheat, sesame) and sunbutter (sunflower spread). I can’t continue havin reactions this week 2x already. The first one being someone opening a PB cup in my room and I literally panicked, may have sent myself into a reaction just due to stress. Anyone have insight to this and does it seem like a histamine intolerance? Pollen is bad this year, have been exposed to cut grass everywhere and I’m sure dust mites from bedding or carpet. I could prob deal with just the hives but the digestive ailments along with it severely impairs my mental state as well. Thank you! Thanks for your question – I have not heard about this effect, but it sounds similar to cases where skin scratching causes itch. One medical editorial discusses histamine and cough. Coughing is a result of postnasal drip, so there may be something in the mucous that, once swallowed or relocated, creates the systemic histamine/allergic response. It’s also possible that you are exposed to something (in airways) that raises histamine, then the cough, itching, and burning are consequential symptoms. I’m sure you are trying to find the triggers for cough, and that will help the most. I’m guessing that you have an excess of mast cells in a location that is activated by heavy coughing, and mast cells release histamine. We all have mast cells in different distributions throughout the body. To reduce the effect, try keeping cough remedies close at hand to prevent the heavy coughing. Sometimes meditation or breathing exercise can help relax the muscles if they overreact. Consider some of the remedies for lowering histamine (B6, vitamin C, zinc, probiotics, digestive enzymes) to help improve the outcome, and let us know what happens. I have had extreme release of histamine when I cough very hard. It affects my whole body causing itching and burning and can last for several hours. Has anyone had a similar experience? Thanks Diane, what a great discovery that colostrum helps with histamine and hives! Colostrum has powerful proline-rich polypeptides (PRP) that may help reduce allergic symptoms, but there is limited research so far. Histamine causes permeability in arteries and veins – often leading to swelling and itching – so it is not surprising that there would be improvement in your hands. Histamine is higher in some patients with varicose veins. These are great insights to share, and hopefully you can slowly reintroduce some of your healthy fermented foods with the right histamine support. Keep up the B6, vitamin C, zinc, and Bifido probiotics known to help break down histamine. Good work! I am 70 and have been suffering with chronic urticaria (chronic hives) for two years. It sent me to the emergency room several times. Of course they always want to put you on some drugs usually benedryl and prednisone which can have terrible side effects if taken for a long time. Out of fear I did give in and take it(predinisone) for short periods at a time. I regret the last two times I got on it as it was a slow process of tapering off it. The doctor ran all sorts of allergy tests with nothing found. I have always been eating what I thought was healthy but realized that it was all very high histamine, like homemade sauerkraut, kombucha, raw goat cheese, sardines etc. So I focused on eating only low histamine foods. I also discovered that quercetin was a great antihistamine and took it faithfully, like 800 mg every 4 to 6 hours. My last bout of hives was almost totally gone, but never completely. Every day I would check my entire body for any sign of the hives and there would always be a small spot here are there. But I was thankful as, at least, I had them under control. Most recently I have been taking Colostrum-LD by Sovereign Labs. Colostrum is the first milk a mother produces for her baby and contains all that is necessary to make her child’s immune system healthy. Colostrum’s life-giving process that is passed from mother to child is the same for all mammals including cows and bovine(cow) colostrum is bio-identical to human colostrum. I have been taking it now for two months and my hives are now totally gone. What I really noticed were the veins on the top of my hands. They had always(at least the last few years) been bulging and ugly. I thought it was just my age and genetics but now they have receded and my hands look amazingly younger. This colostrum is advertised to heal a leaky gut and balance the immune system. It dose not work overnight because it is healing your gut from the inside out, and it is definitely working for me. It is rather costly but when you consider all its benefits it is worth it. You should check it out! The links between menopausal hormone changes and mastocytosis are very complex and poorly researched. Histamine triggers would logically make things even worse for people going through hormone swings, and it appears that this phenomena is linked to the interactions between MAST CELLS and BONE. Bone density changes (including osteoporosis and frequent fractures) are features of both systemic mastocytosis and menopause. Since half of bone loss happens before menopause, it makes sense that mastocytosis would be aggravated during the perimenopause phase if it is driven by bone loss and estrogen depletion. There appears to be benefits in tackling multiple angles of the problem – histamine deficiency actually prevented osteoporosis in animal studies. Another study showed benefits of probiotic Lactobacillus reuteri prevented bone loss associated with estrogen deficiency. This is even more useful when we see that certain Bifido probiotics have been used to help break down histamine and reduce inflammation. The use of probiotics as therapy for osteoporosis is just now being investigated, and it’s probably even farther off for mastocytosis. Bacteria can release histamine in the gut and regulate allergic disease and immunity – for better or worse depending on the mix – so it’s not surprising that we are starting to work with probiotics on so many levels. Female hormones affect gut bacteria as well, so we can start to see why isoflavones (as in soy) can benefit postmenopausal women by increasing our phytoestrogens and beneficial bacteria. One study showed that genistein, an isoflavone, increases cell histamine but stops the spread of mast cells. As you see, we may need to look beyond reducing histamine in conditions like mastocytosis and try to alter the disrupted allergic response, hormone levels, and bone metabolism to see long-term success. I have personally found some health benefits in perimenopausal symptoms by adding specific probiotics like Bifidobacterium and reducing Lactobacillus, but each person is different. Yasmina discusses these in her post on lowering histamine with probiotics. Let me know if any of these supplements (along with low-histamine dieting) work for you! Are there any medical studies re: histamine triggers with people who have mastocytosis & perimenopause.My masto symptoms have increased tenfold. Food contents are now labeled as gluten-free or with specific ingredients like wheat, but histamine is not an ingredient or measured value of a food product. Furthermore, one simple ingredient can have drastically different histamine levels than another sample based on many environmental factors. Hopefully we will see histamine monitoring in the future if the FDA decides to monitor histamine levels for sensitive people. 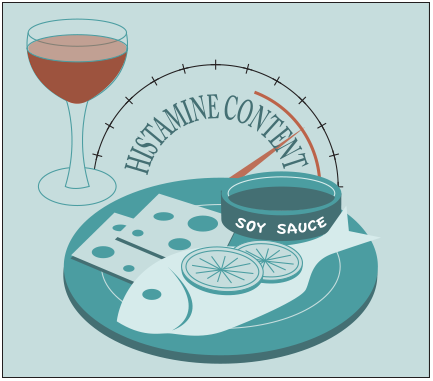 There is a histamine test kit out there for food and beverage, so perhaps it can become part of regular food inspection as well: https://www.oxfordbiomed.com/products/food-science. In the meantime, help spread awareness about food and histamine content! My doctor told me…is worst than glutin intollerance!! in any restourant there are more dish gluten free then hinstamine free/trigger. It sounds like you are on the right path. It is always surprising when allergies or intolerances associate with pain. Keep in mind that DAO reduces histamine in the intestines but doesn’t reach joints and tissues, so it might help lower the “bucket” but not empty it. Be sure to consider checking for mold with moisture meters, use HEPA air filters, and avoid potentially allergenic body care products until you find the worst offenders. Dust mites and mold are two of the most common airborne allergens, and they hide quite well. I had chronic sinus infections with lots of histamine intolerance before I learned about washing linens in hot soapy water, reducing drapery/upholstery, and giving away my feather and down pillows and comforters! Nasal rinsing is also essential after trigger events such as gardening, crowded theater events, or vacations away from home. Some of these simple remedies continue to help pay back lost years of health. Let me know what works best. Wow, I am now wading through all the information regarding histamine intolerance after a nutritionist I am working with suspected it. She asked me to take a Benadryl for 2 days to see if my joint pain symptoms improved. The pain I had had for 10 months was GONE….amazing. She suggested a low-histamine diet for 6 weeks with a DAO supplement. I have had genetic testing and have a heterozygous variation on my DAO gene among other variations. She also suspects mold. I will attempt to see my MD to request mold testing (she requested specifics) because it is so expensive to have this done privately but am not hopeful that this will be met with any enthusiasm. It is so much information, it feels quite overwhelming yet exciting that I may be able to address the myriad of confusing symptoms that I have had off and on my whole life. It started with being a sickly child and I am now 62 and feel somewhat resentful that this is taking so long to become an accepted diagnosis for people. I totally understand the individualism of the condition and therefore the difficulty in treatment recommendations but to just have a diagnosis and to not be made to think you are a hypochondriac would be a good place to start. Because I look and act healthy my complaints are blamed on aging. I accept that to a certain extent but when the solutions are suffer of take this prescription then that is where I find myself losing faith in the system. My goal is to enter my old age in as good health as possible to not burden the medical system, my family or myself with unnecessary illness/surgeries/medication dependence. Thank you for this very informative article and even though there is not a magic bullet plan out there it does give the most helpful advise on my personal wellness journey. Thank you so much. I am dealing with intense urticaria going on 2 months and am desperate for good info, so I deeply appreciate the generosity of people posting. I have successfully treated skin itching with a bee propolis/green tea paste, blending powders of both in a base of colloidal silver or purified water. Based on my research, I believe this combination simultaneously relieves inflammation, reduces bacterial load, and lowers histamine in top skin layers. In one difficult case I also found relief from an acupuncturist who used seed beads on specific points in the ear. Oddly, this auriculotherapy eventually led to some itching in the ear, but it was a tolerable solution as the more acute condition subsided. Let me know if you need to know the acupuncture points. For mild itching, I have also had good results with Florasone homeopathic cream. Ice packs and keeping cool are always very helpful. I have not had to treat solar dermatitis, so please consult with a medical professional to confirm if these remedies will help. And let me know what works for you. Thanks! June 2017. What is your best advice to relief severe itching skin. Thank you for this opportunity to explore histamine, narcolepsy, autoimmunity, and hormones. First, type 1 narcolepsy is associated with up to 64% more histamine neurons than average. This finding is only showing up in human tests, explaining why we haven’t heard much about it. The histamine neurons are found in the hypothalamus which controls our sleep-wake sensations as well as temperature, hunger, thirst, etc. It is very interesting to read how histamine might alleviate symptoms of narcolepsy. It was previously thought that only the loss of orexin was driving symptoms of narcolepsy and related disorders, but now it appears that histamine is involved. Even more surprising is research about what you suspected all along – that narcolepsy is an autoimmune disorder. Narcolepsy is strongly associated with many autoimmune conditions. I suggest diving into this recent paper that explains how narcolepsy might be triggered by viruses as well as autoantibodies. In fact, there are many conditions that involve both elevated autoantibodies and fatigue (Hashimoto’s, chronic fatigue syndrome, diabetes). Specifically, scientists have just started exploring the autoantibodies related to narcolepsy in animal studies. Some influenza A and H1N1 viruses also trigger narcolepsy, and you may have suffered from a viral infection before or during the Depo Provera exposure. Not all viral infections are obvious, and it is worth noting that Depo Provera (and progesterone in general) may increase susceptibility to viruses and reduce the immune response! While I was never diagnosed with narcolepsy, I have suffered from fatigue and sleep disorders that were most prominent when I was eating gluten and eggs. My condition worsened for two years after first experiencing an infection and antibiotics after oral surgery. After getting IgG tests for these foods (IgE was normal), I avoided them and recovered. It is not easy to lower my theoretical “IgG bucket” to impact my fatigue levels. I have to keep a detailed health journal so I can track what works and doesn’t. Eggs still cause me to fall asleep within a few hours, and I suspect that some IgG antibodies pass into the brain more easily than others. It is easy for us to point the finger at autoimmunity. But it looks like our IgG autoantibodies are simply serving to clear out cellular garbage related to other diseases or exposures that create inflammation. This great paper shifted my views on IgG autoantibodies and autoimmunity which is part of a larger balancing act within our body. In summary, some cases of narcolepsy may reflect a deeper struggle with autoantibodies as a result of a battle against bacterial, viral, or even food sensitivities. Allergy tests barely scratch the surface of antibodies in the body, as allergy measures IgE reactions to the environment and not reactions against our own body tissues, viruses, or bacteria. Some doctors can run IgG tests or autoantibody tests, but finding the real trigger among thousands of possible suspects is technically impossible. I suggest discussing the possibility of a latent viral infection with your doctor. Try reviewing the natural remedies for viruses on websites such as Earthclinic.com. I often use apple cider vinegar, vitamin C, garlic, or other natural remedies to improve my energy and resistance to viral infections which are always a threat, especially at certain times of year. By increasing immunity while decreasing exposure to toxins and triggers, I’m able to have twice the success in achieving good health. Please let me know what works for you! I have gone several years with horrible itching and have to take antihistamines daily or I will get so bad I can’t sleep. I have had allergy tests and wasn’t showing any major allergies and at the time the dr said something about histamine but I didn’t really pay much attention. Just thought I would have to take antihistamines forever. Le and behold I also have narcolepsy. Found out just yesterday that there’s a link between histamine intolerance and narcolepsy. This explains so much!! I think it’s all autoimmune disorder and something triggers it in us. For me I will always be convinced the birth control shot called Depo Provera caused everything for me. I was fine until I had 3 shots. What else is this shot affecting besides female hormones?? I think it permanently altered my hormone production and hypothalamus. Mast cell activation disorder is no fun! Thank you for pointing out its significance here. My report did not discuss this systemic problem that presents as severe histamine intolerance. It is so difficult to determine if cases of elevated histamine are a result of full-blown MCAD or just a simple DAO enzyme deficiency, for example. It is true that MCAD is more common than once thought, and it may be even more prevalent if we view it as a broad spectrum disorder with multiple subtypes. I have mentioned in multiple reports the problems with our volatile medical terminology – particularly when we refer to symptoms such as MCAD or histamine intolerance as root causes. The names do not begin to describe the depth about how or why we suffer. There are some underlying associated conditions that may deserve attention such as MTHFR status and the need for methylated B vitamins. As with every unique case, it is so important to keep a detailed health journal and determine every possible trigger in the constantly changing environment. There is no way to test all of the thousands of chemicals that might raise IgE or other Ig compounds that set off mast cells and flood tissue with histamine. Something as simple as a type of soap, jewelry metal, or favorite pillow can be a hidden source of trouble. Mold in bathroom walls is also a common indoor trigger, and I’ve had to use moisture sensors to detect leaks behind surfaces. The only substance that relieved my own mast cell degranulation (in skin) was bee propolis. Research indicates that it anti-allergy effect may vary based its location of harvesting. I used it topically and do not have a known allergy to bee stings. I experienced more trouble with mast cell degranulation when I was recovering from chronic pain associated with gluten intolerance (another symptom of much deeper vulnerabilities and imbalances, of course). Let me know if you have any success with bee propolis, as it is not widely known or discussed. I haven’t read through all the comments here, but I have read a lot on what is called ‘histamine intolerance’. And, I suspect that it’s a misnomer. I think that what is being called a histamine intolerance is actually a mast cell disorder because it is the mast cells that produce histamines. You probably know this. But, check out mastocytosis and mast cell activation disorder (MCAS/MCAD). People don’t get cancer due to histamine levels. The histamine intolerance is the signature, if you will. It’s the mast cell that you have to study. Not the histamine. And it’s very complex. Check out the blog Mast Attack. Everything you’d want to know is there. It’s a brilliant site, and the author is a biochemist who also has mastocytosis. I have MCAS which manifests as “anaphylaxis syndrome”. I can have an allergic reaction resulting in anaphylaxis at any time to anything, and my reaction is not IgE-mediated. My mast cells are defective. No amount of vitamins, low histamine diet, clean environment , or pure diet has helped me. It is a very complex disorder. But, yes, I follow all the histamine protocols. And I still have to carry Epipens everywhere I go and take high levels of antihistamines daily–just to stay alive. It’s a weird thing. Interesting point to discuss, thank you. Climate is a complex factor in our health, especially since it doesn’t affect us all equally. Some people are sensitive to heat, some to cold – as seen in cholinergic urticaria. I personally cannot tolerate much heat without getting swollen red and purple skin, but I don’t get hives or itching. Perhaps we suffer from a form of cholinergic urticaria, a condition that actually involves sensitivity to sweat rather than heat. 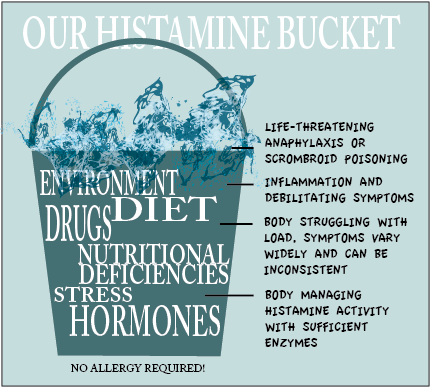 I find that my condition is worse if my histamine bucket is full from other triggers. Changes in histamine certainly alter body temperature, but the effect doesn’t clearly happen in reverse. And hot yoga doesn’t have a reputation for causing anaphylactic shock! More likely we react to something in our local environment that increases with heat – elevated pollutants like dust, ozone, pollen, mold, and even VOCs from beautiful trees. Outgassing of natural and manmade products will increase outside and inside of our homes and cars in hot weather. Histamine content in foods will also go up when food bacteria levels rise with exposure to warm air. Until you identify the biggest triggers in your environment, systemic reactions may be a constant challenge. Of course there may always be a pet, cosmetic or body product, medication, supplement, or even daily food item that can slowly evolve into an overwhelming problem. Allergy tests are generally limited in scope but can help identify the most popular triggers like pet dander, dust, mold, some foods, metals, chemicals, etc. But you will also benefit from keeping a detailed health journal while trying things like thorough housecleaning, vacationing away from home, allergy elimination diet, or new sleeping environments. A low histamine diet is helpful but not curative when there is constant exposure to something inflammatory or allergenic. An anti-inflammatory diet is equally important along with improving B and C vitamins that break down histamine in the body. Let me know what helps, but don’t give up. I’ve seen severe cases improve with something as simple as one housecleaning, while others may be a combination of things like specific tree removal, replacement of bed linens, and avoidance of soy sauce. Hi, I’ve read your article and other articles on HIT with great interest. Over years I’ve had symptoms that I’ve put down to allergies but never known what triggers it. Coughing fits, sneezing fits, headaches that last for days, hives, symptoms like IBS. heartburn, extreme fatigue and brain fog. As I’ve got older (I’m in my 50s) it has seemed to get worse, with family members saying ‘you’re always ill’, yet I never feel quite ill enough to go to the doctor and then it all clears up…till the next time. Recently we had extremely hot weather for several days(unusually for here), then I started to get eczema all up my arms from shoulder to wrist, intensely itchy and painful. I took some anithistamines which helped a little, then the headaches started, then the abdominal cramps and finally I was left exhausted and with brain fog and unable to function normally. When I googled the symptoms, I found this website and it all seemed to make sense. What I’d like to know is, can unusually hot weather bring on an increase in histamines? Could the weather have been a cause or should I be looking at what I’m eating and drinking? Thanks for all the help, I shall certainly be trying out all the suggestions! Yes, histamine is produced when fighting any infection as part of the natural inflammation-based healing process. It is hard to predict which histamine receptors will get involved and how many other areas of the body (outside the mouth) will be affected. A constant release of histamine in a long-standing infection will drain the body and reduce functioning of immune, neurological, and digestive systems. This demonstrates the importance of eliminating any bacterial or viral infections to reduce histamine-related inflammation – thank you. Elevated histamine can result in flushing or digestive disturbances, and alcohol is a major trigger. Avoiding alcohol or fermented foods would be a simple solution. If you continue to have problems, an allergy test would be useful in identifying and eliminating allergens that raise histamine such as dust, mold, or chemicals. Im wondering if im suffering from histamine intolerance because about one year ago I was with a friend enjoying some alcoholic beverages and later that day I became severly ill with symtoms of flushing digestion issues and heartburn to this day im still under similar conditions trying to figure this a lot any help would be appreciated. I have done research on indoor pollutants from printers of various sorts, and our government is not currently protecting people from these health risks. The process of measuring emissions is very difficult – even in laboratory spaces – and an accurate determination of health impact on an “average” person is truly impossible. Unfortunately, laser printers are sources of ultra fine particles that irritate the respiratory system. Furthermore, inks and toners contain chlorinated VOCs which can induce respiratory problems as well as cancer. It has been shown that people have hyper responsiveness to VOCs, especially if they are already prone to allergic symptoms or exposure to smoke. Just as VOCs can increase asthma, they will elevate histamine as they affect allergic inflammation. It is a shame that we do not have stronger regulations regarding installation and operation of these polluting devices. We usually have to endure clear-cut cases of mortality over many decades for legislation to pass. We are creating printing technologies with nanomaterials and vaporized plastics faster than we can test them for human health safety. The concept of “well-ventilated” is very unclear and subject to money and space limitations. I would consider a job change if your health is at stake, and you may find some recourse by visiting a occupational health physician who has worked with similar cases. What a delightfully thorough analysis oh histamine, in a simple format appropriate as a jump -off point for further research. I got a bunch of honeybee stings today while trying to capture a swarm, and one arm is very puffy and painful and I can tell the response was systemic, which I’ve never had before (mild hives and headache and joint pain) so I’ll be looking into some of your pointers and possible ameliorations. Thank you! Thank you for this article. I was diagnosed with food allergies/intolerances about 6 of them. Maybe it’s a histamine intolerance instead. I also have eczema and asthma and it’s probably all related. I will definitely look into getting tested for this. I would like more information too please. Please email me more information, thanks. I completely understand – I get a runny nose from the cold air and indoor chemicals at the grocery store. Exercise can definitely trigger allergic reactions, releasing more histamine in some of us than others. https://www.ncbi.nlm.nih.gov/pubmed/1371041 Keep in mind, allergy tests don’t scratch the surface (literally) of all of the potentially substances. Nasal rinsing after gym exposure might help until things get under control if there are airborne allergens at issue (NeilMed sinus kit works for me). Dr. Kaslow mentions improving calcium, methionine, and buffered C vitamins. I think B6 is another important one. Diet will always be a contributing factor. 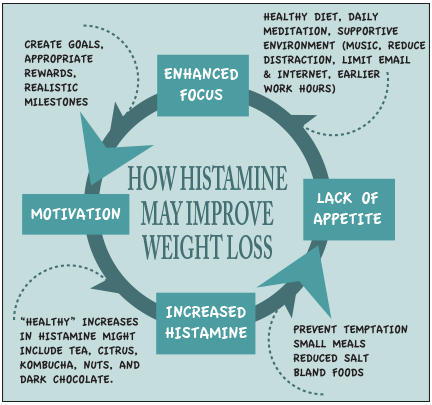 Be sure to follow a low histamine diet for a while as you lower your histamine levels. There are a lot of food lists available online, note that soy and soy protein (common in energy bars) are extremely high in histamine. Let me know what works best. I am a fitness Professional. I workout at least 5-6 times a week and have been doing this for years. I get an”allergic reaction” sneezing, runny nose ( extreme dripping—- totally clear but super annoying) and itchy eyes. This used to only happen a few times a year and seemed to happen when I ran outside when it was cool. It started happening more frequently when I started Crossfit. Sometimes the symptoms are mild. Sneezing and runny nose for 1-2 days. Sometimes the symptoms are so bad that I feel feverish and look like i have the flu for about 5 days. I went to an Allergist and I am really not allergic to anything. I was not having any symptoms when I went so it was hard to describe how the symptoms really effect my life. ( I can not bend over or my nose will drip…and it burns, this effects me at work. This keeps me from spotting my clients) My head feels like it is so congested and my eyes feel so itchy and they look terrible. Have you heard of anything like this with exercise. My throat gets scratchy but doesn’t feel like it is closing. This reaction is so random. I never know when it will come on until I am finished with my workout, then as soon as the workout is done within minutes my nose starts running uncontrollably and the sneezing starts, then the itchy eyes. Fitness and exercise is what I do and like I said it is random but I would love some advise. …..An informative, interesting and complicated read….and a sometimes difficult read, but thank you.. Yes, I should have clarified that it is important to avoid irritants as well – technically they are not allergens but can trigger a reaction. They include smoke, carbon monoxide, and VOCs that abound in our indoor environments. Aldehyde, benzene, polychlorinated biphenyl, and xylene are examples found in cleaning products, paint, and varnishes. VOCs are quite high in some car interiors, and I’ve had pretty severe symptoms if exposed for a long time in the heat. The TRUE Test for allergens includes chemicals and fragrances and usually involves differentiation between allergy and irritant. You may want to call ahead to the dermatologist to be sure they offer this or other tests that are more fine-tuned. Let me know what happens if you do! How does one identify airborne allergens when anything scented sets them off? A co-worker using cleaning supplies, someone wearing cologne or perfume, and for me – simply walking down the aisle of laundry detergents. It is frustrating. Great news about the l-methionine, as I have not heard much about that solution. Methionine, taurine, and cysteine are aminos that contain sulfur and play important roles in detoxification. One doctor describes the histamine details online: http://www.dcnutrition.com/amino-acids/sulfur-amino-acids-cysteine-taurine-methionine-homocysteine/ Don’t forget about taking B and C vitamins as well as identifying and eliminating airborne allergens. Sometimes it can be as simple as a feather pillow or down comforter!